Rocky Patel's Vintage 1999 Connecticut cigars hold the honor of being covered in the oldest true Connecticut shade wrappers on the market (aged 7 years) according to Rocky. 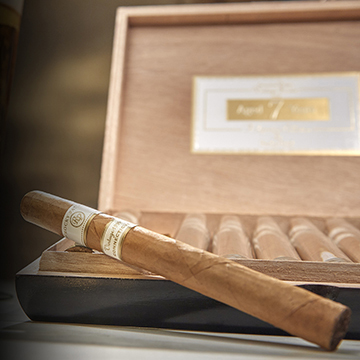 The Vintage 1999 is hand rolled in Nicaragua with 5-year-aged Nicaraguan and Dominican long fillers bound in a similarly aged Nicaraguan binder for a mild to medium-bodied, well-balanced smoke with toasty, buttery notes and a smooth, creamy finish. The Vintage 1999's flavor and aroma rank it high on the morning cigar list and its impeccable construction will leave you with little else to do but relax and enjoy it.